Much of the information Dr. Lesse collected and reported with regards to Tommy's behavior and other family problems was reported to him by Rush Jr., during an extended interview: Rush recalls hearing from the neighbors that "Mom had no control over Tom. If he got mad there was nothing she could do about it." Evidently the patient would be very responsive to a man who was large in size. For example, they would often threaten to call Mr. Phelps, a neighbor of large size who would come in and make Tom behave. "At times I think Tom brought Mother to tears." Rush stated that if the parents were away, "things could get out of hand." On those occasions they also threatened Tom with the idea that they would call Mr. Phelps in. When he would get out of hand when his father was home, "Father would wallop him." Everyone missed the parents when they went away. "You could depend on Tom acting up when the folks were away." Rush Jr. goes on to discuss his father's frequent struggles with alcohol, and the general presence of alcoholism in the family. "Father began to drink much more intensively after Mother's death. This appears to have become progressively worse. He was in High Watch Sanitarium for two weeks in February 1976 after an intensive drinking bout." In terms of Tommy, Rush describes his brother doing "a fair amount of drinking," Unlike his father, however, Rush reports that Tommy would be more easygoing while under the influence of alcohol. He also characterized Tommy as being generally impatient and impulsive, but, at the time, beginning to mellow somewhat. For whatever reason, it seems that Tommy and his brother Michael were exceptionally difficult children who suffered from remarkably similar behavior disorders. Both were sent to see Dr. Ellen Blumingdale, a psychologist, for a period of time in 1971. 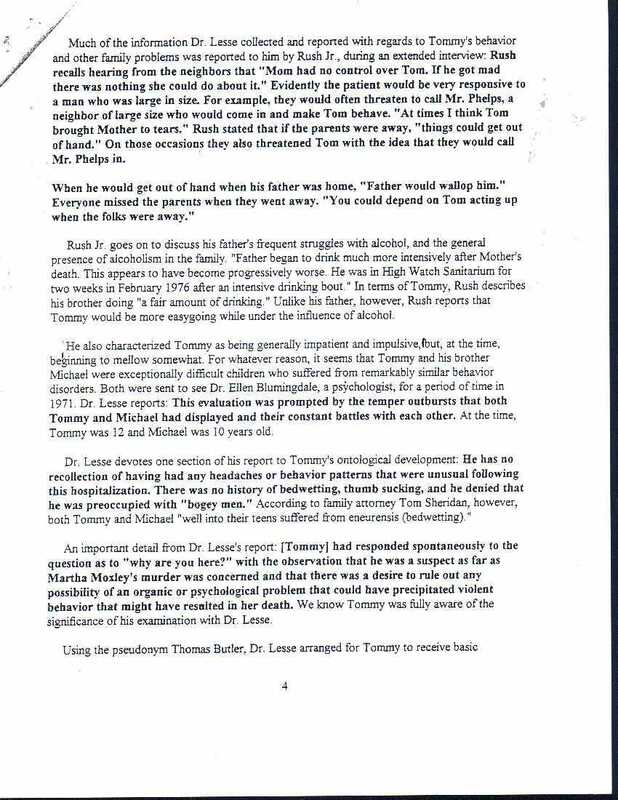 Dr. Lesse reports: This evaluation was prompted by the temper outbursts that both Tommy and Michael had displayed and their constant battles with each other. At the time, Tommy was 12 and Michael was 10 years old. Dr. Lesse devotes one section of his report to Tommy's ontological development: He has no recollection of having had any headaches or behavior patterns that were unusual following this hospitalization. There was no history of bedwetting, thumb sucking, and he denied that he was preoccupied with "bogey men." According to family attorney Tom Sheridan, however, both Tommy and Michael "well into their teens suffered from eneurensis [sic] (bedwetting)." An important detail from Dr. Lesse's report: [Tommy] had responded spontaneously to the question as to "why are you here?" with the observation that be was a suspect as far as Martha Moxley's murder was concerned and that there was a desire to rule out any possibility of an organic or psychological problem that could have precipitated violent behavior that might have resulted in her death. We know Tommy was fully aware of the significance of his examination with Dr. Lesse.